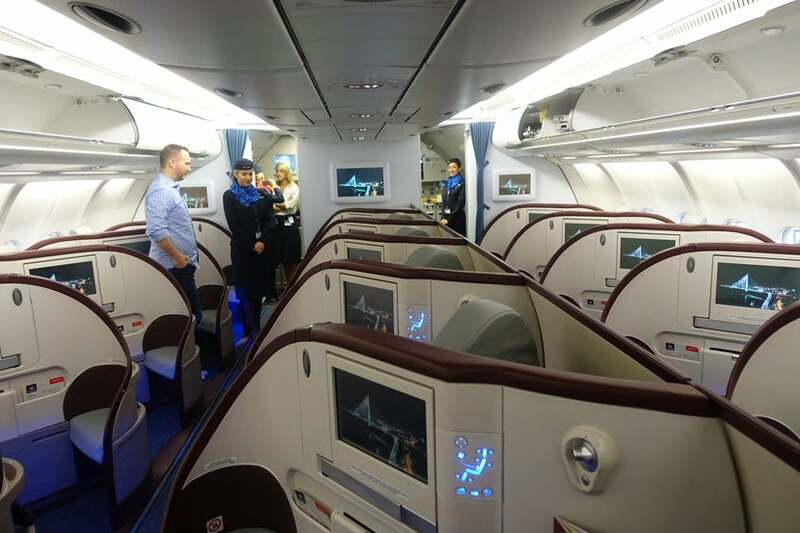 TO THE POINT: Air Serbia recently launched nonstop service from New York to Belgrade with a retrofitted two-cabin aircraft. 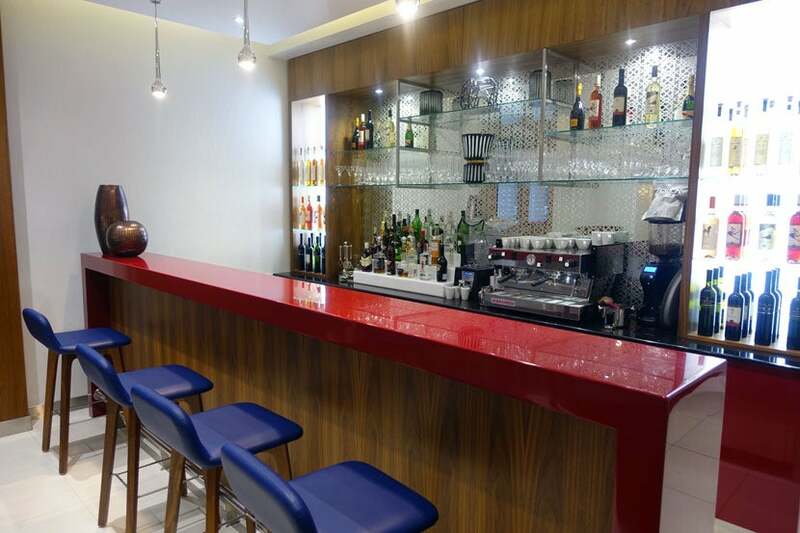 The pros: wonderful service, a luxurious lounge, and 18 cozy lie-flat seats. The cons: low-quality bedding and pillows, plus a quirky seat that only lets the tray table come up when it’s in the upright position. After barely recuperating from my American Airlines mileage run, I was off and running again, this time to a part of Europe I never pictured myself traveling to: Belgrade, Serbia. 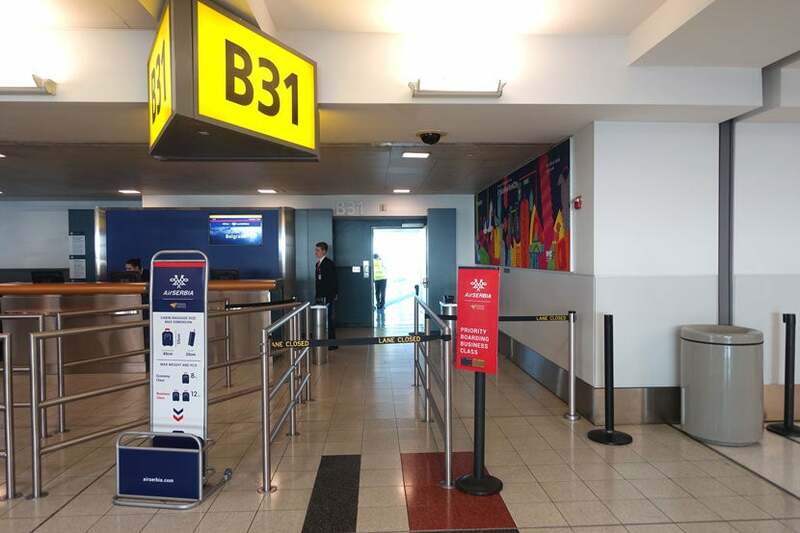 As one of TPG’s seasonal intern trips, the plan was to have me fly round-trip on Air Serbia and test out the airline’s new nonstop service between New York (JFK) and Belgrade (BEG). After completing an in-depth tour of both cabins, I was ready to roll. 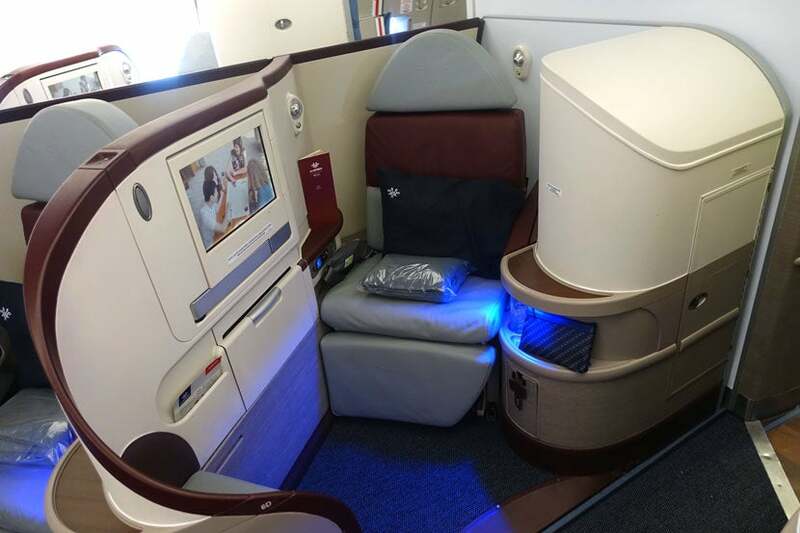 Here’s my review of the carrier’s business-class product, with details from both legs of my trip. When our team finally decided where each of us were going, we looked at whether or not purchasing a business-class ticket or redeeming Etihad Guest miles through partner airlines would be the best way to go about it. The cash price for purchasing a ticket at the time was $4,424, or 128,164 Etihad Guest miles. Clearly, using an award redemption was the best decision, since TPG values each Etihad Guest mile at 1.4 cents per mile and our redemption value ended up being about 3.5 cents per mile — that’s like spending $1,920 instead of paying $4,424 for a ticket. Since I didn’t have Etihad Guest miles readily available in my accounts, my options were to transfer Amex Membership Rewards points or Citi ThankYou points at a 1:1 ratio. Since Amex Membership Rewards points transfer instantaneously, I decided to do just that. Award availability on this route was pretty open, so I chose to depart from JFK at 7:30pm on Friday, July 29, and return from Belgrade at 7:30am on Tuesday, August 2. 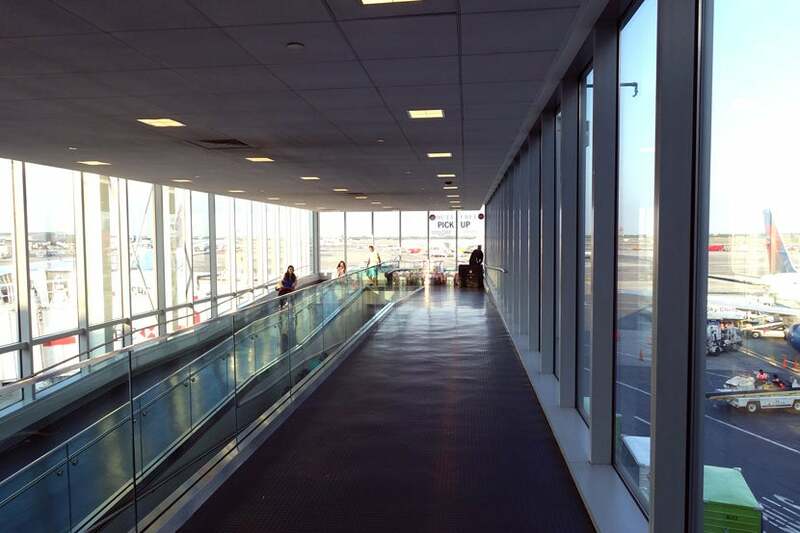 After arriving at JFK, I immediately made my way toward security. To my surprise (and disappointment), Air Serbia doesn’t participate in TSA PreCheck, but luckily for me, the first/business TSA line was empty. With not much time to spare, I headed toward Gate B31 in Terminal 4 in time for my 6:30pm boarding time, and 7:30pm scheduled departure. 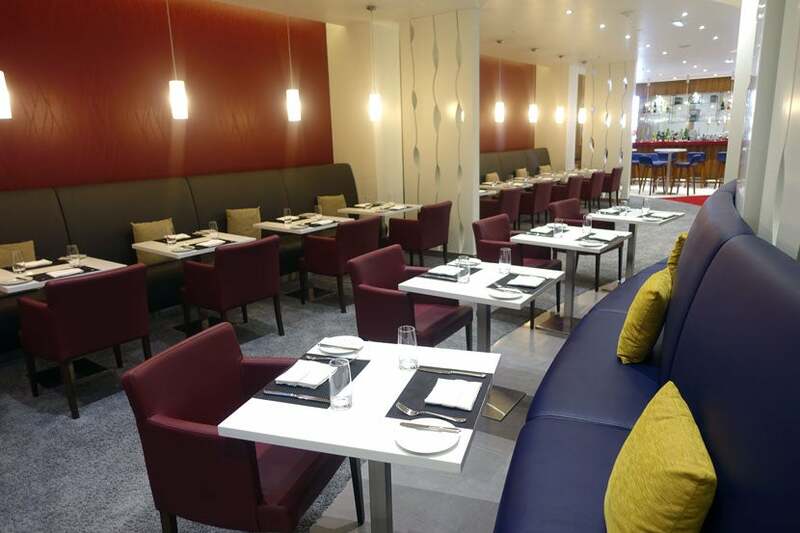 Air Serbia is now a partner of Etihad Airways, so customers flying to Belgrade have access to Etihad’s luxurious lounge at JFK. Unfortunately, the lounge didn’t open until my flight departed, so I didn’t get a chance to check it out on the way to Belgrade. 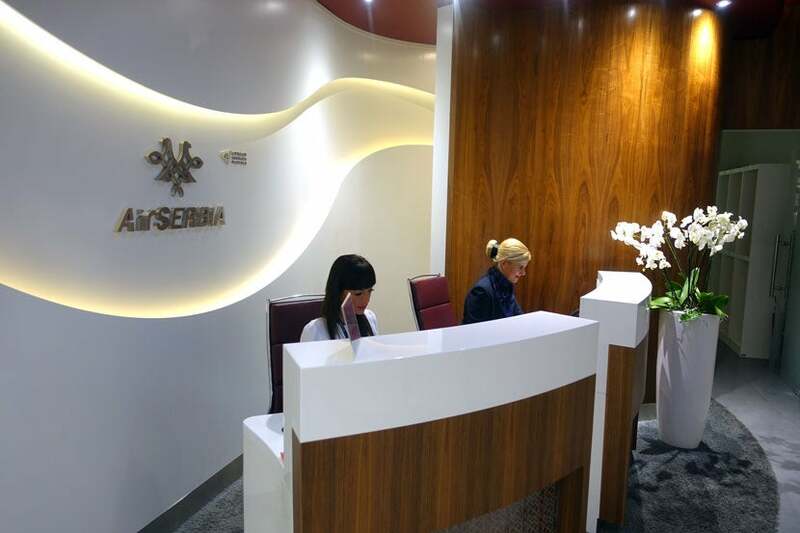 Air Serbia also shares check-in counters with Etihad first class at JFK. A major perk (or disadvantage, in some cases) of flying with Air Serbia is that the carrier only operates one aircraft on this route, so unless weather gets in the way, you should be able to tell if the flight will be on-time well in advance — and this flight was. 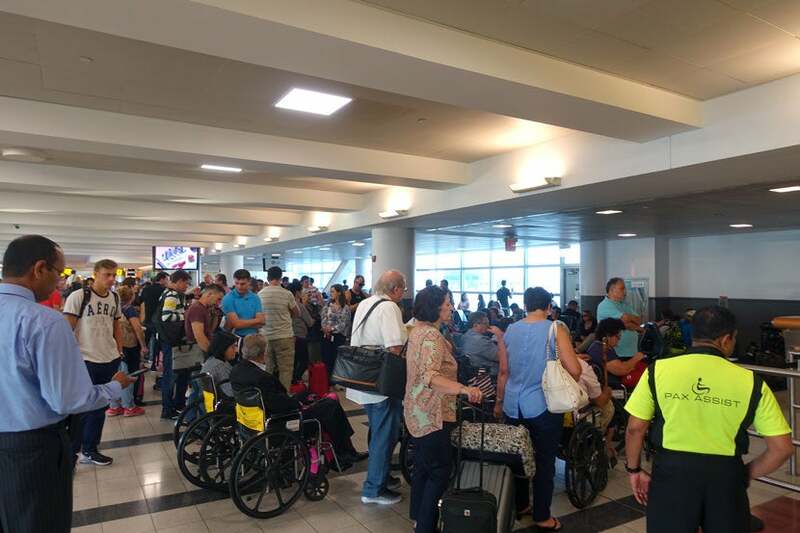 The boarding area was heavily congested, with people constantly rushing be first. Thankfully, Air Serbia tried its best to enforce the boarding process. 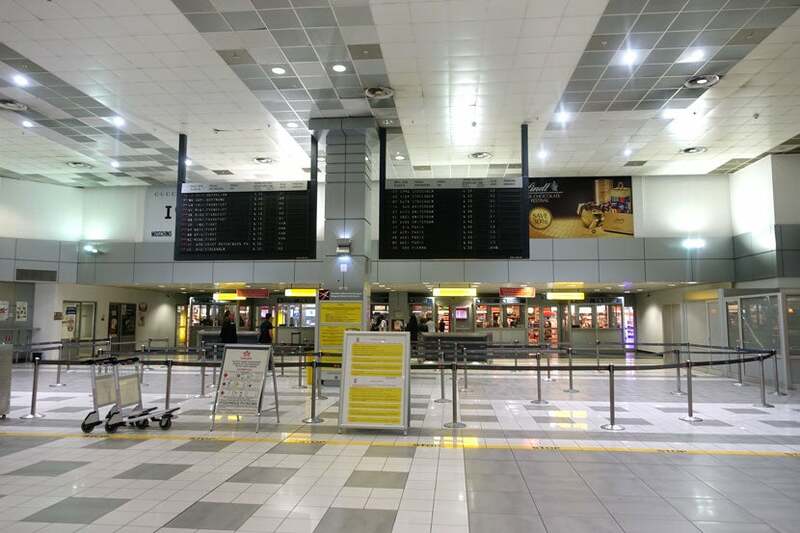 Business-class passengers were called shortly after family boarding started. The only problem was the jet bridge became heavily congested since passengers were being let through without the cabin door being open. 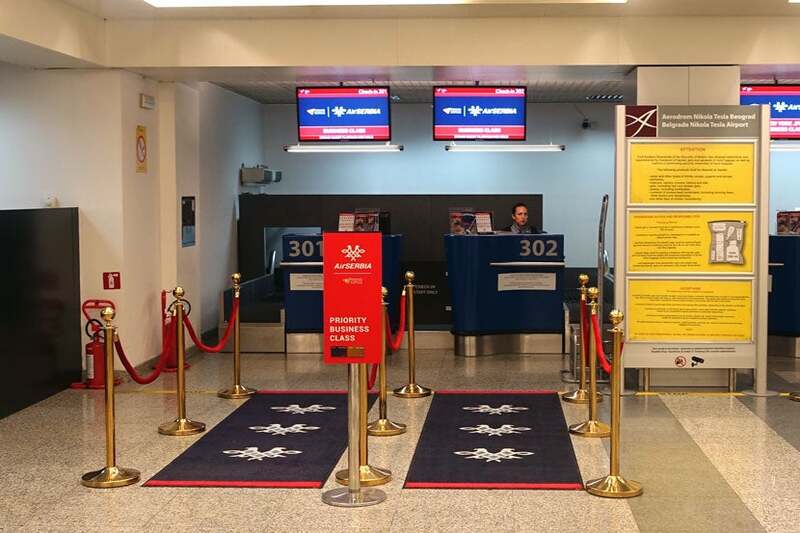 The dedicated check-in area at Air Serbia’s hub is very private and off to the side, separate from economy cabin check-in. The counter agents were very kind and welcoming, which was nice. After a quick check-in process, the agents pointed me in the direction of immigration control. It was a pretty quiet scene at 5:00am, even given the fact that at least 200 more passengers would soon be on their way to my BEG–JFK flight. After arriving at the airport at 5:00am, I’d already made it to the Air Serbia lounge by 5:20am. Even though it was early, the lounge was fully staffed, and offered a large spread of breakfast items. As you enter, the front desk agents guide you around on a quick tour of what’s available in the lounge. 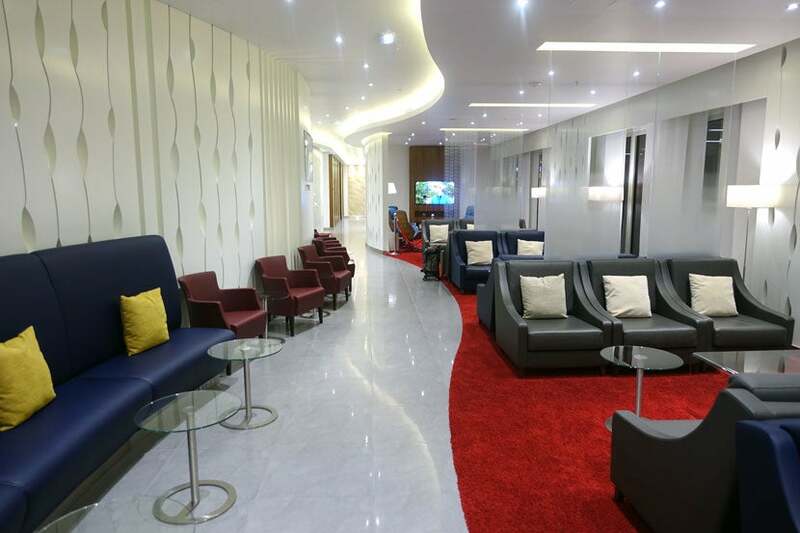 Many US airlines should take note of how this particular lounge operates. The brightly lit and lively space offered plenty of seating for families and solo travelers, with lots of extra room to spread out in. On the other side, the dining area was set up with more than 12 tables with a bar on the far end of the room. The hostesses continuously kept watch and were ready to assist whenever you needed something. The bar featured lots of liquors from many countries. No matter how tempting it was to do a wine tasting, which I was offered multiple times, it was simply too early in the morning for me, so I stuck to my favorite morning drink: orange juice. 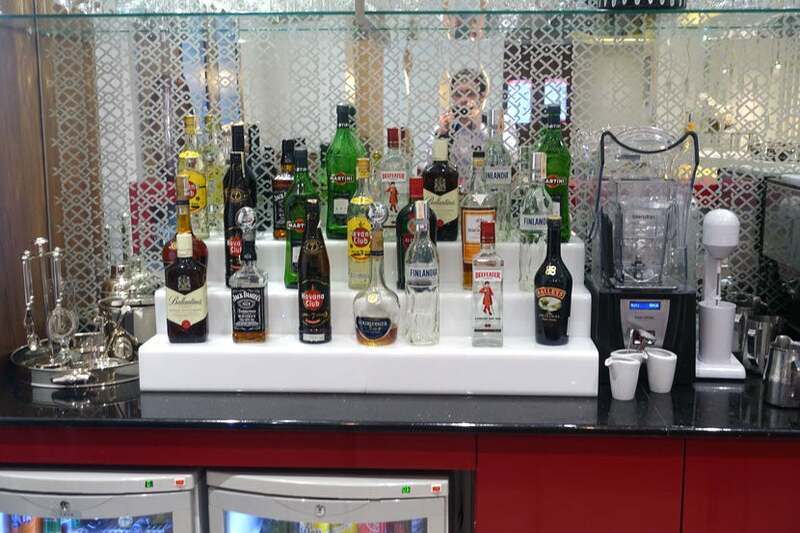 For anyone else who can’t find it in themselves to start drinking so early, Air Serbia offers a large selection of coffees, teas, juices and other soft drinks as well. As I turned the corner into the dining area, I couldn’t believe what I was seeing. Yes, I’m used to finding this sort of thing in other international lounges, but I was caught off guard by this one’s lavish breakfast spread. I really didn’t expect there to be so much food this early. Not only was there enough food for 30 people, but the chef continuously brought out more, even after I only had a few bites of a dish. The breads, croissants (with multiple flavors), danishes and rolls throughout the table were simply spectacular. 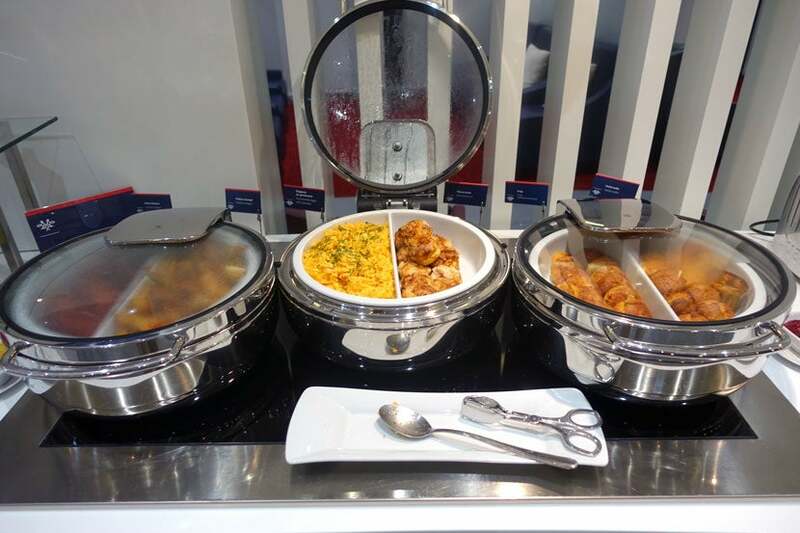 Chicken, meat and cold cut sandwiches were served for breakfast as well — obviously, the chef wanted to make sure all kinds of cuisine were available for jet-lagged travelers. 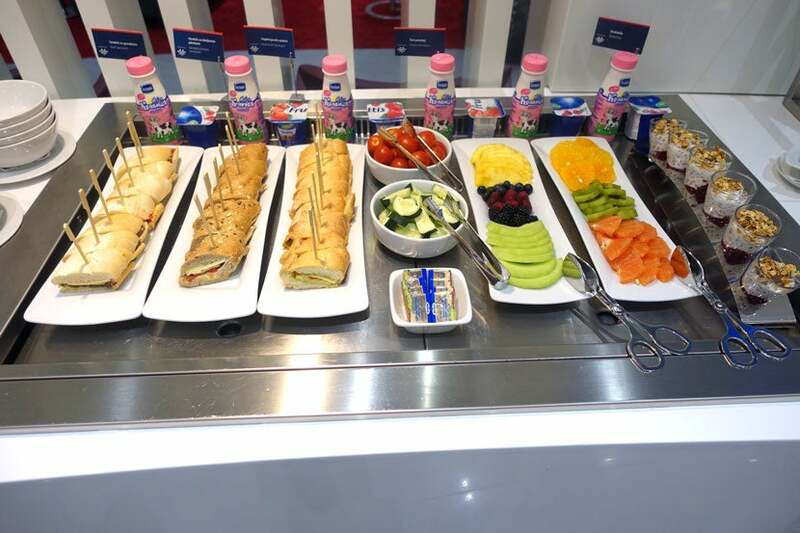 In addition to fresh, deli-prepared sandwiches and breads, there was also an abundance of fruit and yogurt, all of which were incredibly fresh as well. 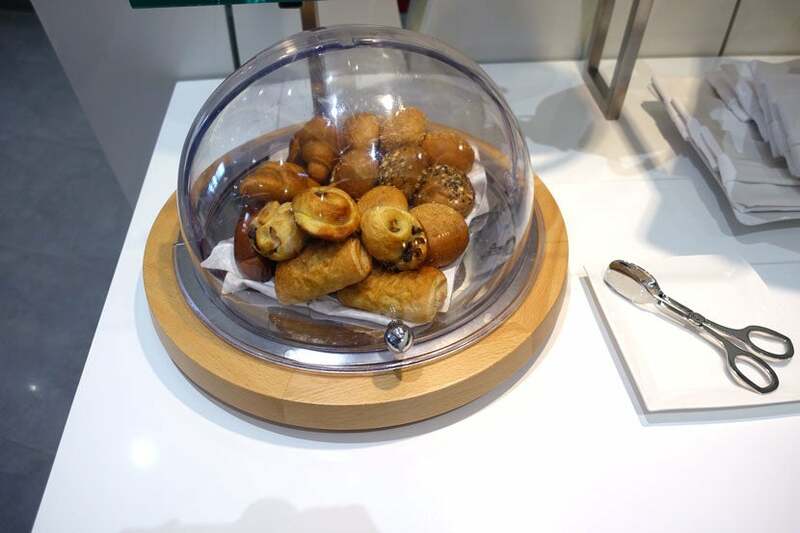 Those looking for some hot meal choices can find scrambled eggs, cheese and spinach pies, bacon and sausage, among other hot, morning goodies. 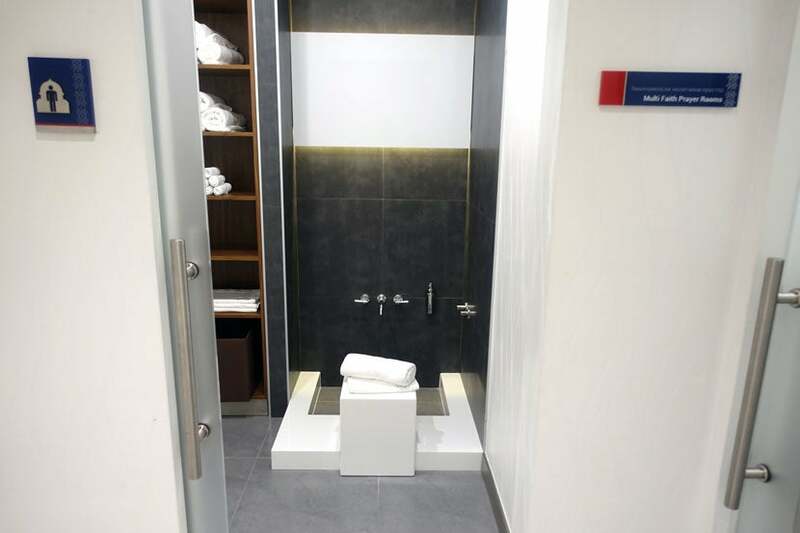 On the other side of the lounge, showers and washrooms featured male and female washrooms and multiple shower rooms so no passenger would have to wait. 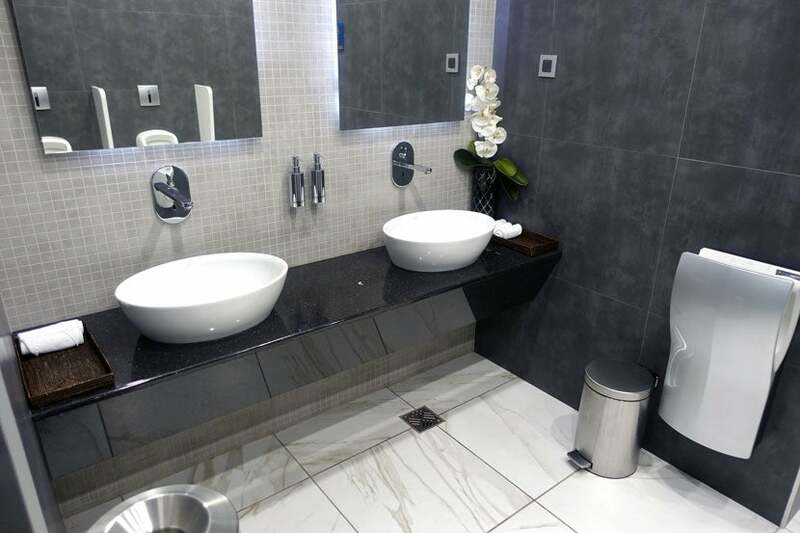 The bathroom and amenities reminded me a lot of the Amex Centurion Lounge. Since I’d just checked out of my hotel, I didn’t really need to try out many of the facilities, like the shower, but I can understand how useful they’d be. I noticed that immediately after a guest used the shower, an attendant stood by to ensure the room’s cleanliness. During the boarding process, there were flight attendants standing by to make sure everyone settled in comfortably. 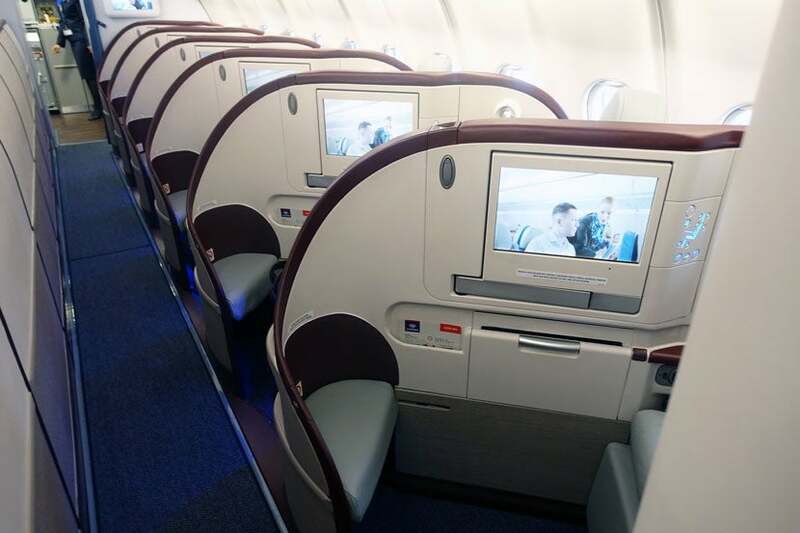 As soon as you walk in, you’ll notice the cabin is large, but not so large where you feel like you can’t have any privacy — that’s a problem with many premium-cabin products these days, but since the seats are angled toward the aisle, it feels a bit more private. Rows A and D are angled toward the aisle and each other, but you can still see the person sitting beside you (though not very much). Row K is the prime spot on this aircraft if you’re traveling solo, or just want some privacy while you sleep — the view from your seat is just the wall instead of the other seats. Below, you can see row K at its finest, as private as you can get on this flight, with fewer people in close vicinity. My seat, 6K, was perfectly cleaned and ready for me, with the standard Air Serbia mini-film rolling. 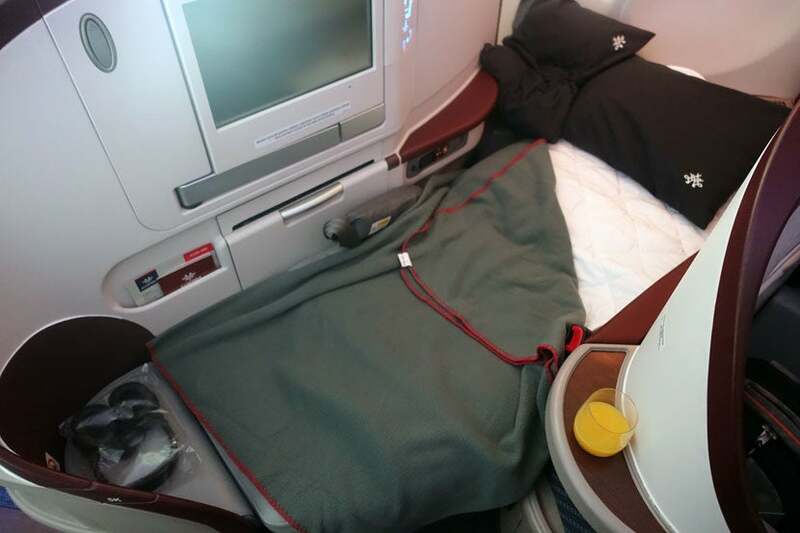 Once seated, you’ll find the menu, an amenity kit, and a sadly sub-par blanket and pillow. 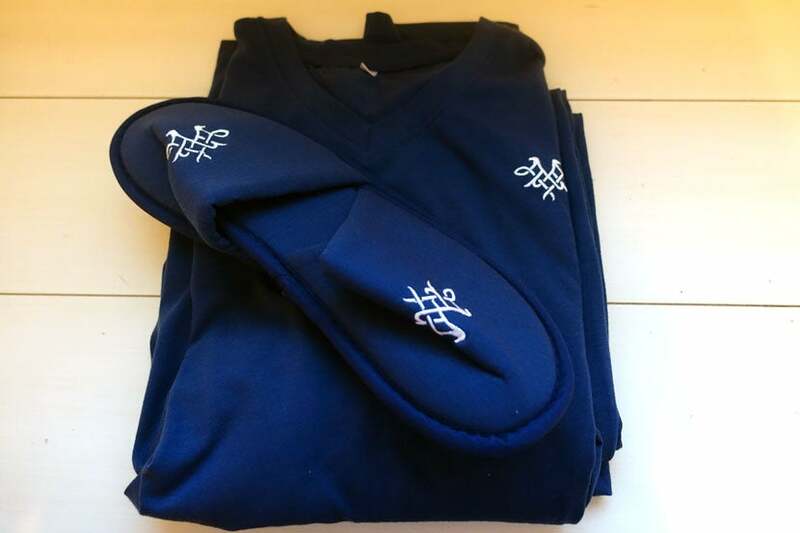 One of the problems I had with Air Serbia’s product was the “covers” we received. Although you’re provided with a mattress pad when you ask for your bed to be made up, the blanket you’re given is very thin and looked a lot like the blanket that’s given out in economy. Since the cabin wasn’t overly crowded, I snagged another blanket and cover from one of the other seats so I’d be more comfy. 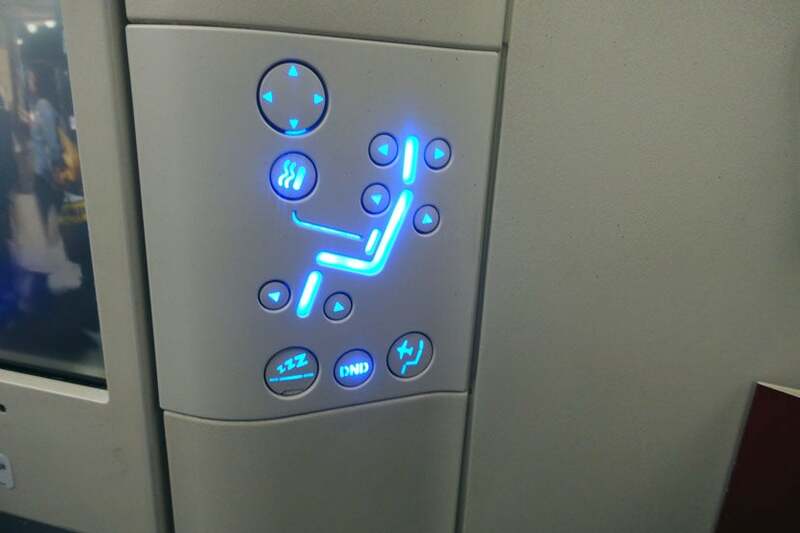 The seat reclined fully and came with a convenient “Do Not Disturb (DND)” button to notify the crew whenever you’d like some privacy. Repositioning the seat was a surprisingly noisy feat, but since it eventually went down, I was happy. Another seat quirk: the tray table could not be moved around and only came up from the side when my seat was in its full, upright position. Immediately after the meal service, the crew cleaned my suite and offered to make up the bed as I freshened up in the forward bathroom. As you can see, the covers were quite thin, and two pillows were a must. When I wasn’t eating or sleeping, I was on my laptop surfing the web. 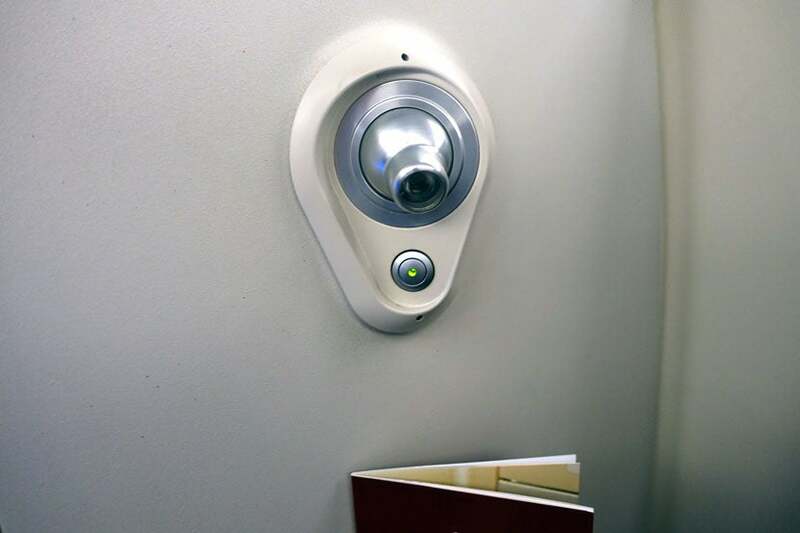 For an international flight, the Panasonic Wi-Fi was about average. 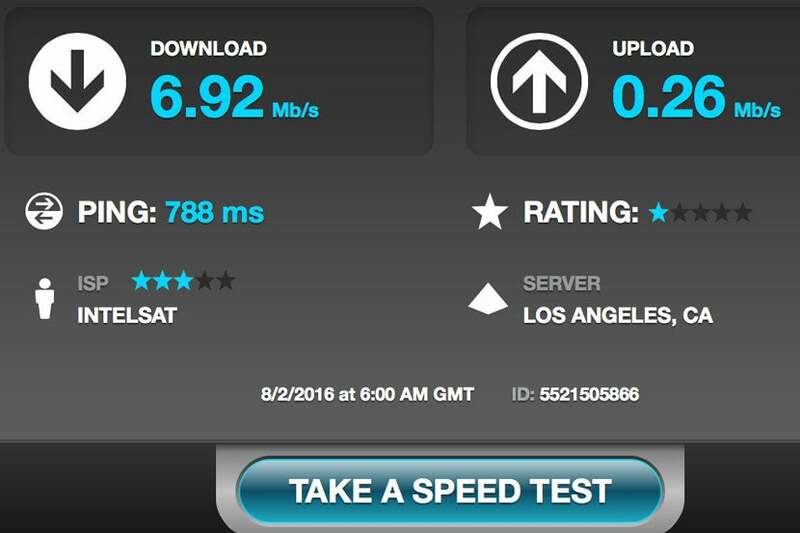 In other words, I was able to check my email, but the speeds were nothing to really write home about. 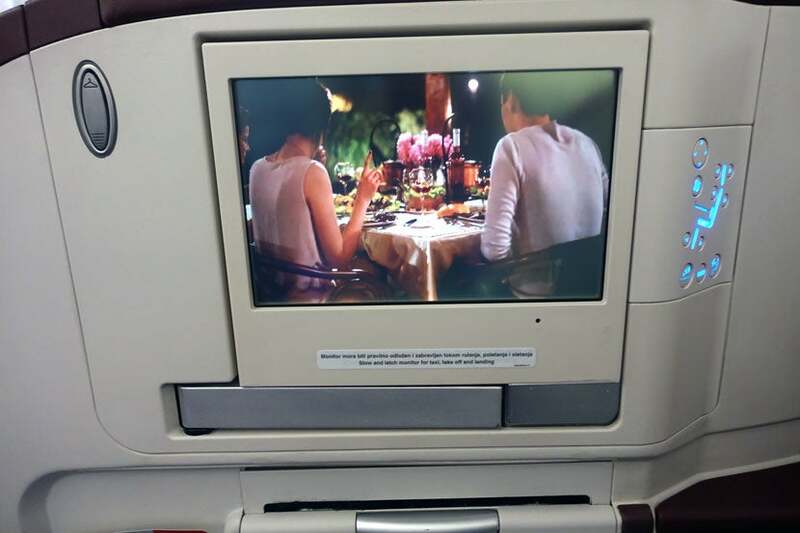 While I’m not one who likes to always have the in-flight entertainment system open — I prefer to throw my pajamas on and shut the shades — it was nice to have access to a bunch of movies and other entertainment options during the meal service. 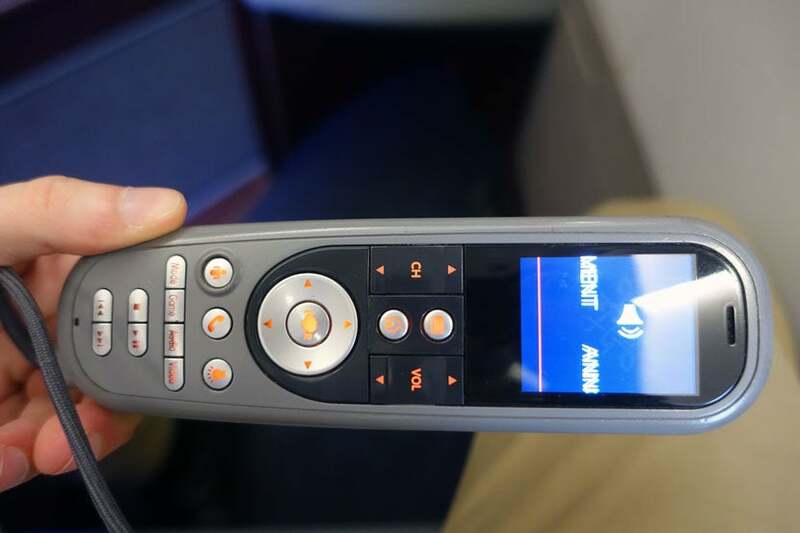 The corded remote controls the IFE screen, overhead light and also houses the call button for when you need assistance — surprisingly, we were actually encouraged to do so on this flight. 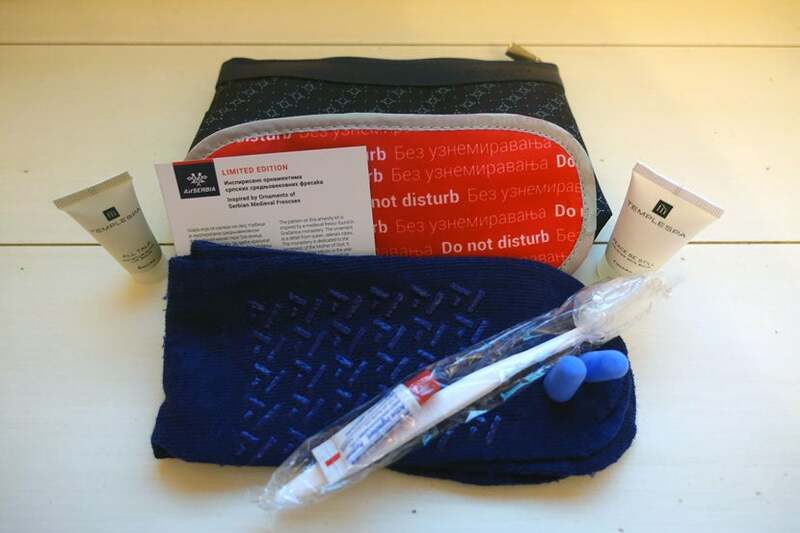 While not all amenity kits are not created equal, Air Serbia’s was perfectly fine, but not over the top, with standards like a toothbrush with toothpaste, eye mask and socks as well as several Temple Spa creams. As my bed was being made up, I was offered a pair of pajamas, which are extremely comfortable and not too thick. The V-neck shirt fit me perfectly, but the crew were more than willing to have me try on different sizes just in case I wasn’t fully satisfied. The flight attendant noticed my dress pants and shirt on the seat next to me, and when I woke up, she told me she’d hung them up in the closet (without me asking) — what a nice touch! 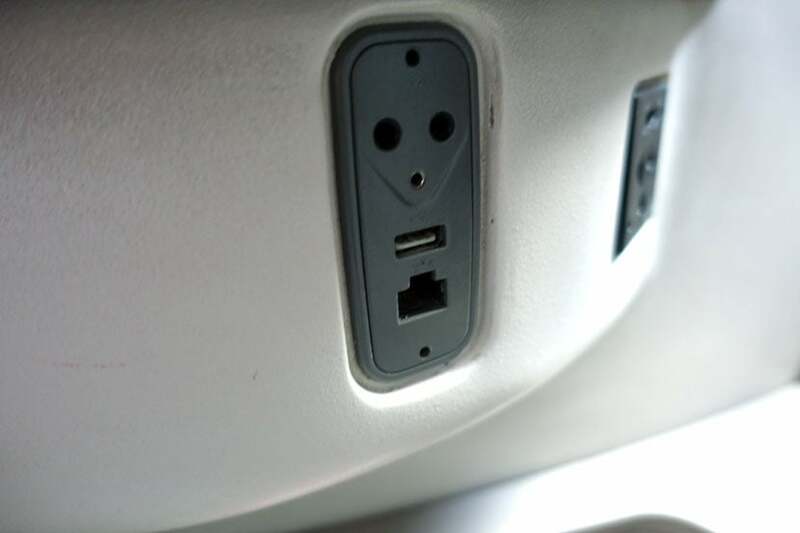 Each seat came with an outlet for your headphones, a place to charge your devices via USB and an international three-prong wall charger. I noticed this part of the seat was starting to show a little wear and tear. Each seat was also equipped with a light overhead as well as one on your right side, which offered multiple stages of brightness. 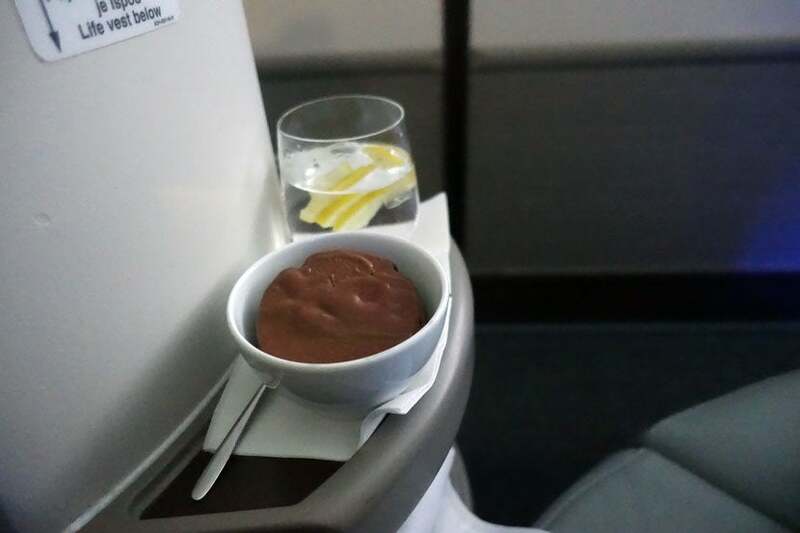 As soon as each person settled in, a flight attendant came around with the menu and offered a selection of drinks. Since this leg departed at 5:00pm, it was the proper time for cocktails, unlike my flight coming home from Belgrade would be. 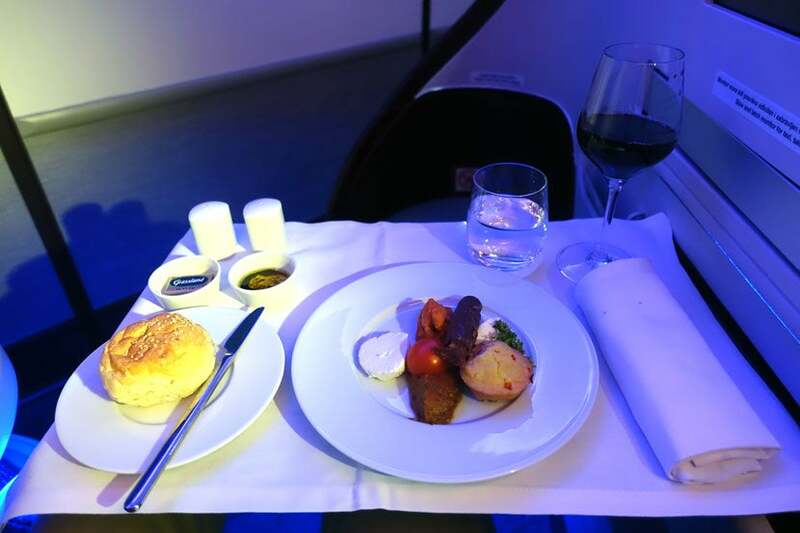 Air Serbia began dinner service immediately after we reached 10,000 feet and wrapped it up quickly. 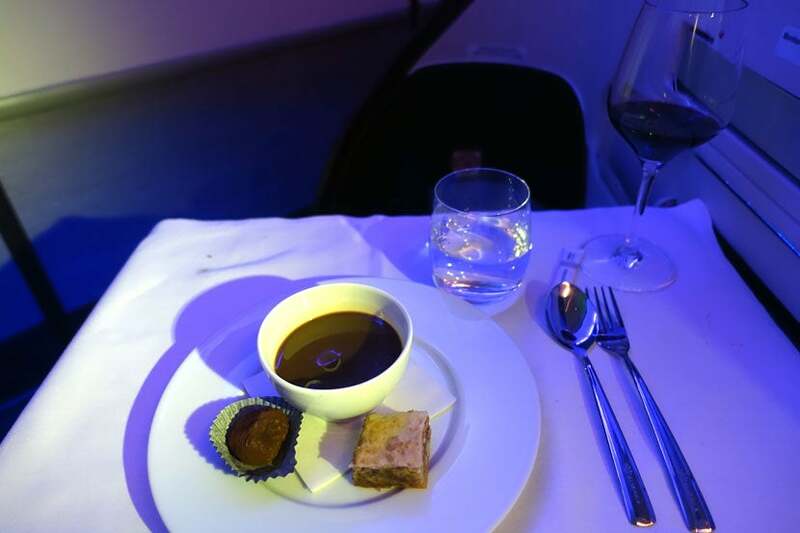 Although another full meal wasn’t offered prior to landing, snacks (which were big enough to count as meals, really) were available throughout the flight and just before arrival. For dinner, I started with the Serbian Mezze (beef prosciutto and Serbian cheese) served with toasted sesame seed bread (with olive oil and butter), along with a glass of red Podrum Radovanovic wine. Although any airline can have great food, the service and attitude of the flight crew made this one feel even more special. For my main course, I decided to go with the a nice medium rare steak served with truffle sauce and vegetables, which came nicely cooked with sauce that complemented it nicely. Dessert options included a fresh fruit salad or a trio of strudel, chocolate chili truffles and coffee caramel panna cotta. In an effort to taste the best of the best, I chose the latter and I was very pleased. 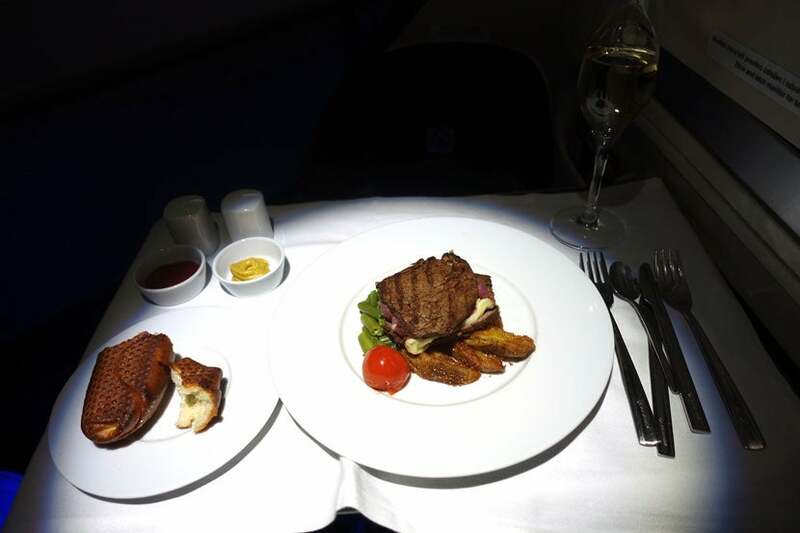 The dinner selections on the eastbound flight were superb and left me wondering if this was just a fluke or if all the meals were usually this good — as I later found out, they’re always delicious. 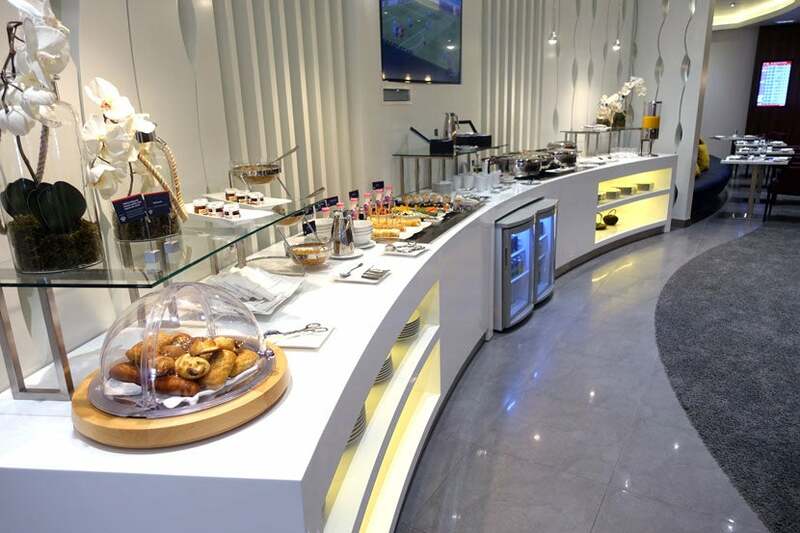 After spending more than an hour checking out Air Serbia’s lounge, I wasn’t too hungry. Coincidentally, breakfast wasn’t served as a huge meal, though it was more than enough for my taste. I had the spinach pie served with sausage and some morning breads, all of which were very tasty. Since this flight was the longer of the two, I decided to go for a snack this time around — the choices included smoked chicken wraps, toasted paninis, cheese platters, steak, fruit and ice cream. Initially I chose the ice cream, thinking I’d just have a snack before touching down in New York, but after tasting it and seeing other people being served their “snacks,” I had to treat myself to another. 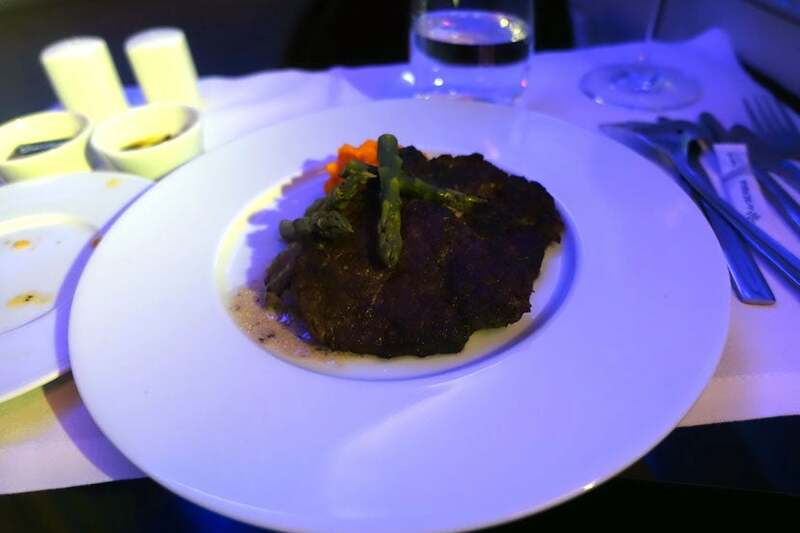 This time I chose the steak (again), which was really well prepared, fresh and served hot, even toward the end of the flight. Not once did the crew doze off or get lazy, which tends to happen toward the end of other long-haul flights. 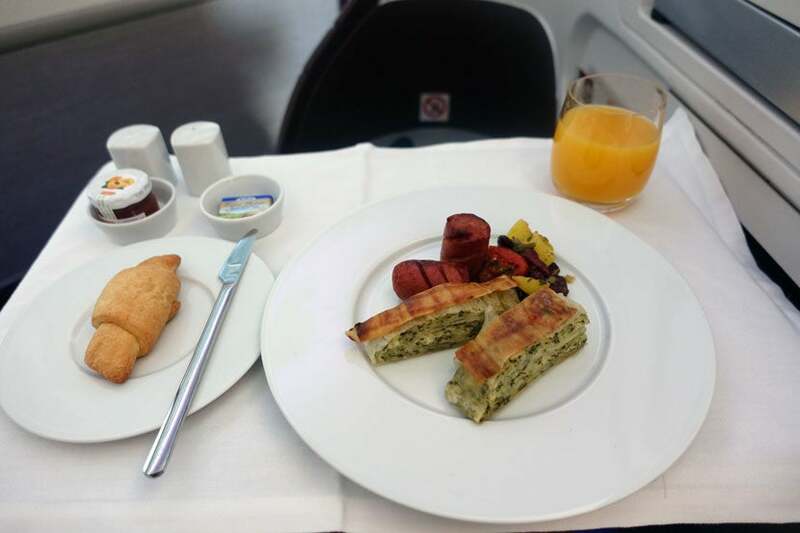 After settling back home and adjusting to the six-hour time difference, I finally had time to reflect on a trip that was put over the top by the service provided on Air Serbia. A trip is always more comfortable when traveling in style, comfort and around people who really know what they’re doing. 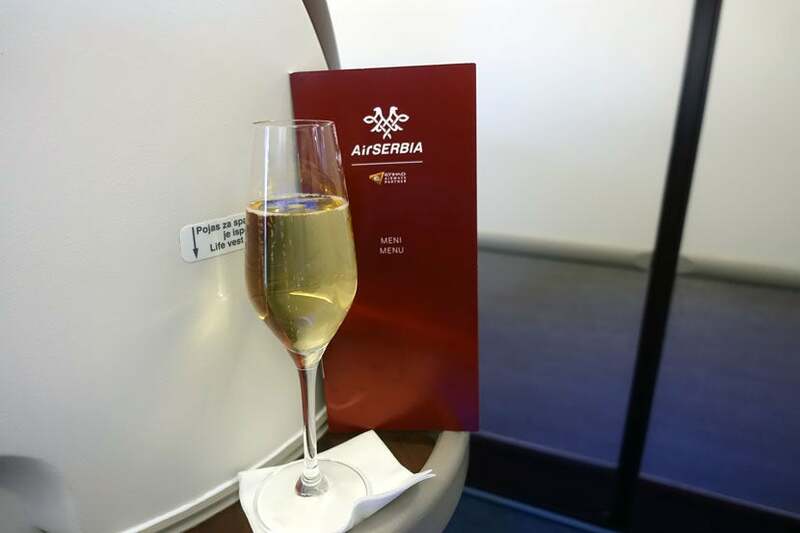 From efficient check-in counters and an elaborate lounge to the perfect seat to sleep in, Air Serbia has quite the business-class product, and I look forward to flying in it again the next time my travels take me to eastern Europe. 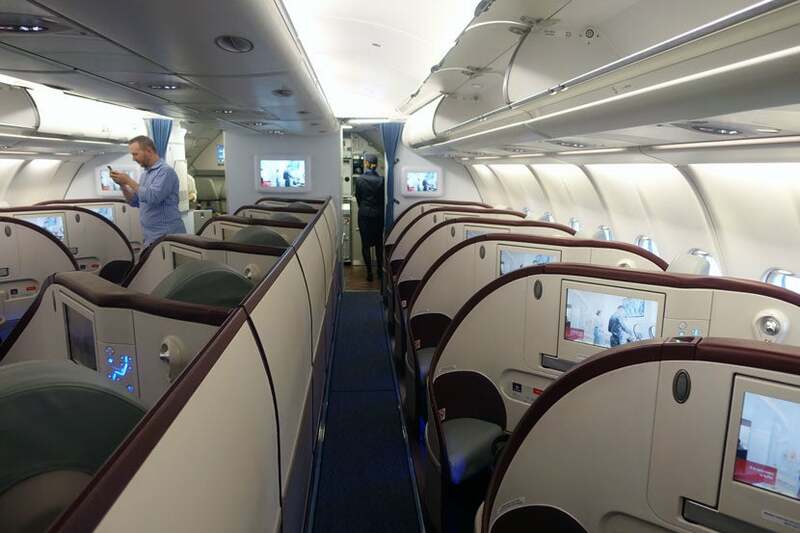 Have you flown in Air Serbia’s business class yet?